Easy Pay per View options for Banner Advertising on J2Ski, from £50 per month. RECOMMENDED :- For targeted Pay per Click advertising by more experienced advertisers, we recommend using Google Adwords to advertise on J2Ski. We offer two levels of Subscription based Advertising to suit a range of budgets and requirements. From just £50 per month you can promote your business throughout our site and you can stop, start or upgrade your subscription at any time (minimum period is one month). We'll run Banner Ads for your business - to be provided by you, in a standard MPU format (see below). We'll highlight your website in our Directory pages, and list it toward the top of the appropriate category. 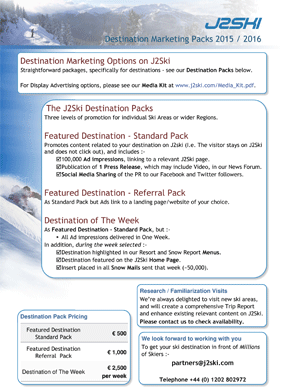 £20 per thousand (CPM) - Run of Site - your ad displays across J2Ski.Com. £25 per thousand (CPM) - Targeted - your ad can be targeted to sections of the site (e.g. chalet pages), or by visitor country (e.g. only to French visitors). This table shows the monthly cost of each Subscription Level, with the minimum number of ad views we guarantee to deliver each month. Start a Platinum Subscription today and get DOUBLE Ad impressions for the first month! Decide how many times you would like your ads displayed each month and click the appropriate SUBSCRIBE button above. As soon as you've set-up your PayPal subscription, just e-mail the ad graphic you'd like us to use (which must measure 300 pixels wide by 250 pixels tall), in PNG, JPG or GIF formats, to ads(at)j2ski.com and we'll do the rest. Your Ad must be in the format shown here (known as an MPU), and can be any common image type, such as GIF, JPG (J-Peg) and PNG. Try to use a similar layout to the example shown above - with a single picture and some short, punchy text. This is what generally gets the best response. Please do NOT wildly animate your ads or use garish colour schemes; our visitors won't click them and we won't run them. If you'd like advice before creating the ads then please ask and we'll be happy to help. We aim to give you a certain number of "impressions" or "views" per month. This means that we will display your Ads that many times in total, throughout our site, each month that your subscription continues. This form of advertising is commonly referred to as "pay-per-view". Your total views will be spread evenly through the month, so if we guarantee you 10,000 views per month then your ads will be displayed roughly 330 times each day. Where possible, we deliver a different Ad on each Page that a User visits and we rotate the Ads shown through all of our current Subscribers in turn, proportional to the Subscription Level. We can provide you with statistics on how often your Ad is displayed, and the number of click-thrus to your site that we record. You need only pay for one month at a time and may start or stop your subscription whenever you wish. Please Note :- we aim to deliver a minimum number of ad views each month. Due to our high traffic levels, our advertisers often receive significantly more than the guaranteed number of impressions, free of charge. In the unlikely event that we are unable to deliver the minimum, however, we will allocate you additional views in the following month. We cannot guarantee that anyone is going to click on your ads, or that they will then buy anything from you! We will, however, work with you to ensure the best performance possible. Please Note:- You must read and accept our Terms of Acceptance before submitting any site for consideration. Inclusion is at our sole discretion. 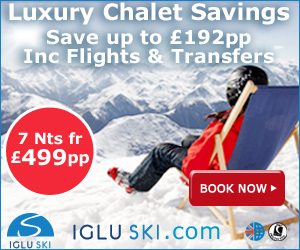 Certain other ski sites require hundreds of pounds to advertise for even a short period, with no guarantee of success. 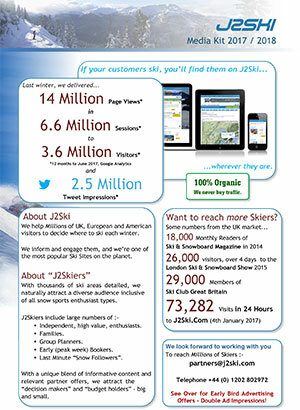 You can start advertising on the J2Ski Sites for just £50, you can pay-as-you-go and you can cancel at any time.